Periodically, I muse on the loss of the American sense of good craftsmanship. Today, we are so dependent on cheap goods from China or third world countries. In our homes, we have so little that is well made and was created thoughtfully and even fewer items that were made under inspiration and joy. I recently found a biography of the artist, Virginia Lee Burton. She is best known for her writing and illustrations of children’s books. You may say- who?- but if I start listing her titles you would immediately recognize them- “Mike Mulligan and his Steam Shovel”; “The Little House”; “The Blue Caboose” etc. But one thing I did not realize is that Virginia Lee Burton was heavily involved in the Arts and Crafts Movement out of Boston. She became a well known designer of fabrics through her group called the Folly Cove Designs out of Gloucester Massachusetts. There she taught design classes which produced pupils who then contributed to Folly Cove Designs. What I loved about her process was that it was entirely handmade from the artist. 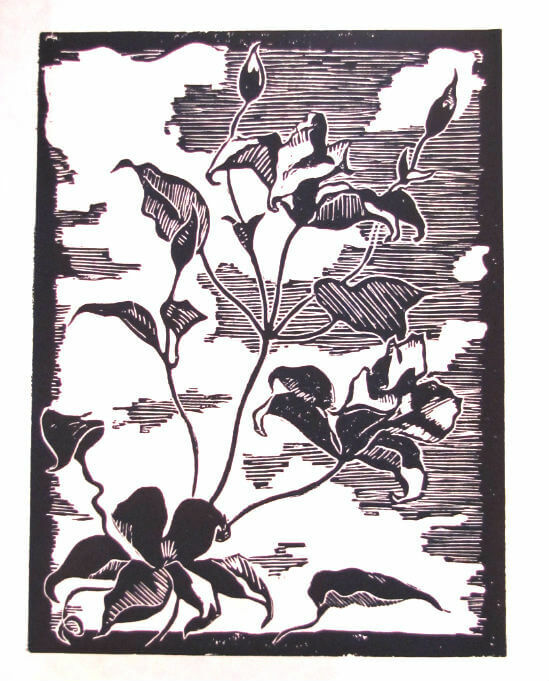 Burton designed and carved her own relief prints. 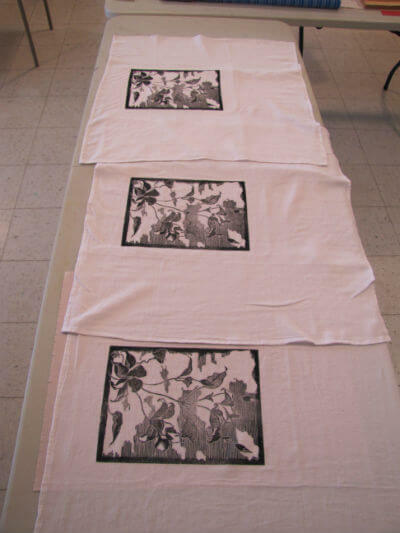 She used linoleum blocks for the image, carved them, which sometimes took up to 80 hours and then printed them by hand multiple times on reams of fabric, or drapes, linens etc. The designs were beautiful and many times contained a bit of humor which was so a part of her personality. 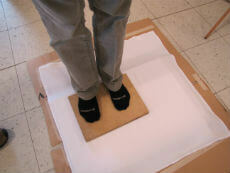 In the beginning she printed by standing on the block to transfer the image to the fabric. An exhausting process that I myself have experimented with recently. The images that follow, experiment with her process. As yet I have not perfected the process and have had difficulty finding the right fabric, with as little nap as possible, that will maintain the integrity of the image. I also, used block ink that can be laundered but found that it takes quite a bit of inking to build up the surface to the point that it has sufficient ink to transfer to the fabric. I inked in this manner: I began at the bottom of the image, “Clematis and Clouds” (The color which is hard to see in the photos was a deep blue/black), and ran 2 passes side by side and then proceeded to rotate the block, using 3 passes on the long side and 2 passes on the short side. I inked all 4 sides and took a proof. As this turned out light, as I expected, I continued to build up the surface with ink. By my 5th proof, the image was coming out perfectly. I proceeded to move to the fabric. The first transfer was extremely light as I expected. In the end, I needed to complete 20 passes on the block to get the image to transfer with an intensity in the darks. That is a lot of rolls and a lot of muscle power. I also needed to transfer the image with some force. So I used the Burton method and jumped up and down on the block to print it. 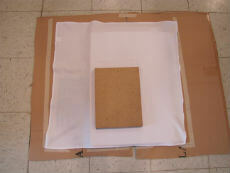 As you see from the photos, I created a template to align fabric and block so as to get the image centered. In the end, I could only print 6 fabric designs in an afternoon. 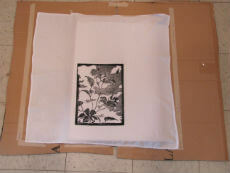 There were 5 proofs on paper before that and one edition print to conclude the afternoon. Two things I learned were 1. I need fabric that is 100% cotton but with very little nap( I used Aunt Martha’s flour sack towels) 2. 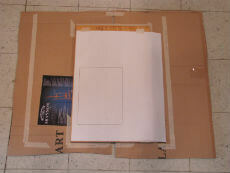 That I need an ink that is cheaper and more durable- Burton used oil paint with white printers ink (a lot of clean up). 3. The more detail in the carving calls for more passes in the printing process. Overall I am happy with the results and it shouldn’t take too much experimentation to arrive at a satisfactory result. In the end, even with those prints that were imperfect, there still remained within the object a sense of impassioned creativity. And this is really what makes things that are crafted well a joy to experience on a daily basis. This is what so easily becomes lost in this world of cheap goods. When I see something truly crafted, I can partake of the inspiration, the creative insight as well as the love the artist had in crafting the object. All is laid bare within the object communicating a lived experience that becomes shared, that goes beyond the singular experience of the artist. The object becomes the symbol, a meeting place, where real beauty resides. What a lovely print. Thanks for putting it up and for your description of the processes I had no idea there was so much physical force involved! I would never know it from the beautiful result. I was so impressed with your research on Virginia Lee Burton. I had no idea about her contributions yet have grown up in a nearby community to Gloucester. Also, your description of the process was so clear and thanks for the photos. Since you live so close to Gloucester, you should visit the historical society. In their collection, they have the archives of Burton as well as those of Folly Cove Designs. If you venture that way, please fill me in. I would love to hear of your findings. Be sure to look for her manuscript on design that she was in the process of writing before her death.